^ a b Gardner, A. (2005). Wilson, D.E. ; Reeder, D.M., eds. Mammal Species of the World: A Taxonomic and Geographic Reference (3rd ed.). Johns Hopkins University Press. pp. 3–21. ISBN 978-0-8018-8221-0. OCLC 62265494. ^ Szalay, F. (1982). Archer, M., ed. 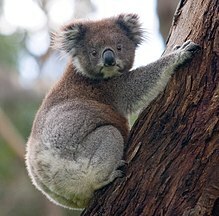 "A new appraisal of marsupial phylogeny and classification". 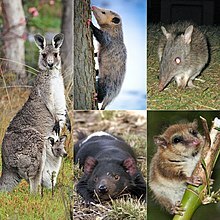 Carnivorous Marsupials. 2: 621–40. ^ a b c d e King, Anna (2001). 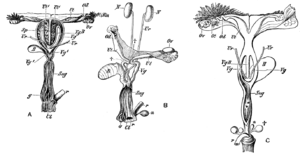 "Discoveries about Marsupial Reproduction". Iowa State University Biology Dept. Archived from the original on 5 September 2012. Retrieved 2012-11-22. ^ Beck, Robin M. D.; Godthelp, Henk; Weisbecker, Vera; Archer, Michael; Hand, Suzanne J. (2008). Hawks, John, ed. 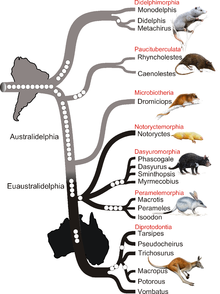 "Australia's oldest marsupial fossils and their biogeographical implications". PLoS ONE. 3 (3): e1858. Bibcode:2008PLoSO...3.1858B. doi:10.1371/journal.pone.0001858. PMC 2267999. PMID 18365013. ^ Luo, Zhe-Xi; Ji, Qiang; Wible, John R.; Yuan, Chong-Xi (2003-12-12). "An early Cretaceous tribosphenic mammal and metatherian evolution". Science. 302 (5652): 1934–1940. Bibcode:2003Sci...302.1934L. doi:10.1126/science.1090718. PMID 14671295.